The new federal tax law expands the use of Roth IRAs in retirement plans, opening the door for tax diversification. Roth savings accounts were introduced to 401(k) plans by the Economic Growth and Tax Relief Reconciliation Act of 2001. This law allowed for the designation of a Roth 401(k) plan beginning in 2006. These plans were then expanded in 2010 when in-plan conversions were made available. But the Roth conversion was limited to participants who had a “distributable event,” such as reaching the age of 59½ or terminating employment. The American Taxpayer Relief Act of 2012 made in-plan Roth IRA conversions available to all participants in the plan. The process of converting traditional, pre-tax 401(k) savings to a Roth account within a retirement plan is very similar to a standard Roth IRA conversion. The in-plan conversion is a taxable event, and participants are required to report the amount of the conversion as ordinary income on their tax return. 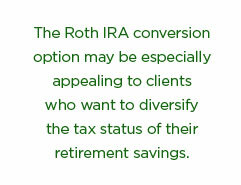 However, unlike with Roth IRA conversions, there is no recharacterization option to “undo” an in-plan Roth conversion. IRA owners who convert assets to a Roth have until the tax-filing deadline to recharacterize a Roth conversion, or a portion of that conversion, back to a Traditional IRA, and incur no taxes or penalties.